Online registration is convenient and simple to use. Register just yourself or choose to sign up multiple people under the same transaction to simplify your billing. Each attendee is able to receive their own registration confirmation via the email given and you receive just one invoice...it’s easy! Register now thru July 8th, 2019 and receive an Early Bird Discount! Signing up multiple attendees? There is a 20% discount offered to groups of 4 or more full-conference professional registrations. To receive this discount, all registrations must be part of one online payment, or mailed or faxed together (this offer cannot be combined with other discounts). Single-day registrants get the registration packet and associated food and refreshments. Visa, MasterCard, AmEx, and Discover credit cards are accepted forms of payment for online registration. Checks are accepted when checking in at the conference. If you need to pay by wire transfer, please contact registration@infoag.org and the wire transfer information will be emailed to you. Please note: InfoAg is NOT responsible for wire transaction fees. Attendees are required to pay the fee if the wire transfer is not initiated at a U.S. Bank. A $25 fee should be added to the total registration amount if the wire is initiated at a foreign bank. All credit card transactions are processed in U.S. Dollars. 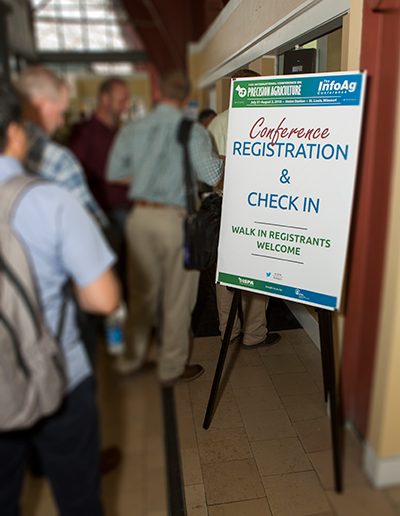 The InfoAg Conference has welcomed attendees from throughout the United States, across North America, and around the world. Click on the Map below to see a world view of where fellow attendees will be coming from. If you require a personal letter of invitation to attend InfoAg, contact the conference secretary by email at: info@infoag.org. In your email, provide the following information: complete name, mailing address, and any other details that your country of residence requires for your visa application. The Conference cannot contact or intervene with any U.S. Embassy or Consulate office abroad on your behalf so please begin your visa application process as soon as you determine that you want to attend InfoAg. Please provide as much information as possible to avoid delays in receiving your letter. You must register for the conference before requesting an invitation letter. Conference registrants will receive a name badge at check-in. Customize your Badge Name in the Personal Information section of the registration process. Cancellations received thru July 1, 2019 will forfeit 50% of their registration fee. Confirmed registrants who cancel after July 1, 2019 or who do not attend the conference will receive no refund and forfeit their entire registration fee. Substitutions are welcome and can be made at any time, including at the conference. If you have any special needs or dietary requirements, E-mail or call (217) 762-7955.